No matter whether it’s our body, face, or lips, any beautynista knows that hydration is the key to great skin. But, it seems that are lips are often overlooked. Between the summer heat and cold winter winds, lips suffer all year long. At the end of July The Mentholatum Company, makers of Softlips products, introduced a brand new baby to the family … Softlips Intense Moisture Lip Balm. The new Softlips Intense Moisture Lip Balm ($2.69) is a lip-hydrating product for beautynistas that combines innovative hydration properties and breath freshening technologies. Can a beautynista ask for more from a lip care product? The new lip balm is available in three fresh minty flavors, Berry Mint, Citrus Mint and Double Mint, with each offering additional ingredients for specific issues. All three flavors contain SPF 15, shea butter, murumuru seed butter, and breath freshening properties. Berry Mint is a nourishing antioxidant rich formula that soothes, helps repair damaged skin and restores suppleness to the lips; Citrus Mint contains vitamins C and E to smooth and help repair dry, flaky lips; and Double Mint has an extra boost of mint for freshness. The Makeup Examiner’s addiction to lip products has been satisfied … for the moment. And if you’re looking for an equally satisfying lip balm, with a little color, check out Softlips Tints ($3.69). 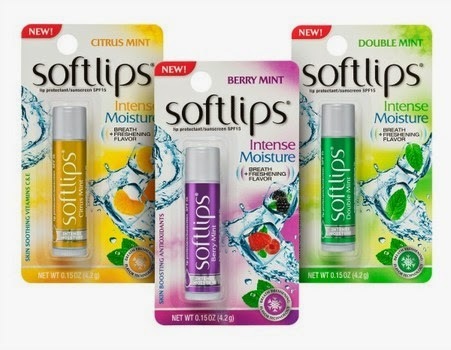 Softlips IntenseMoisture Lip Balm will be available at mass retail locations nationwide in September.